This represents part two of a survey of Civil War monuments in 14 towns across the South Shore of Massachusetts. The monuments are presented in chronological order. The earlier monuments (1867-1879) are covered in part one. These first monuments were entirely architectural in form, obelisks or victory columns, lacking any statuary (except a couple of eagles). Beginning in the 1880s, designs began to incorporate the classic infantryman that we typically associate with Civil War monuments today. 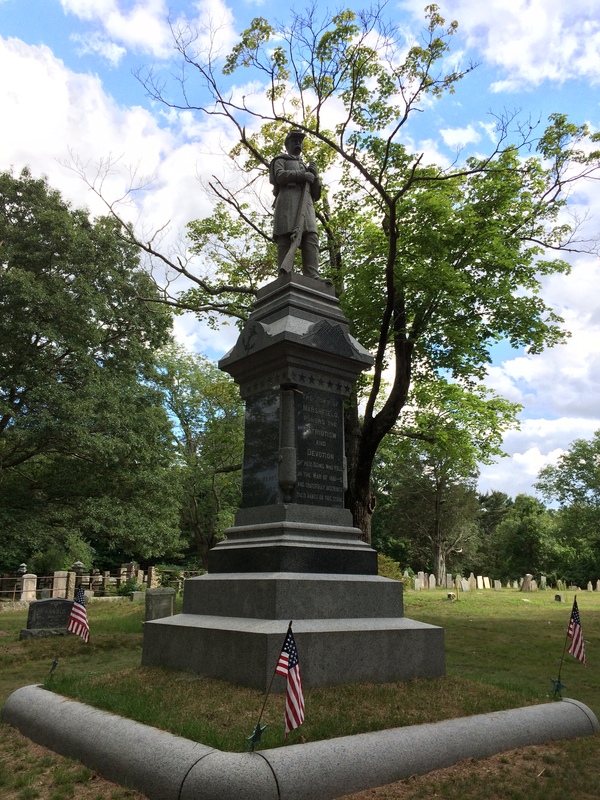 For information on monuments across the Commonwealth, see the website of the Massachusetts Civil War Monuments Project. As mentioned in part one, it is interesting to note that the fundraising and organization behind the construction of these monuments was almost always coordinated by women’s groups. What was it about this memorialization of the Civil War that placed it so solidly, by the standards of the time, in the sphere of women’s work? That topic is something I hope to address in a future post. The Kingston monument is absolutely singular in that it is the only South Shore monument, to the best of my knowledge, to list the name of a woman who lost her life in the course of the war. Martha Sever left Kingston in 1861 to serve as an army nurse. While tending to the sick and wounded at the army hospital in Beverly, New Jersey, she succumbed to influenza and died on November 13, 1864. The GAR post in Kingston was named in her honor. For additional photos including names see “Kingston” at the Massachusetts Civil War Monuments Project. Marshfield: Located in the Marshfield Hills Cemetery adjacent to the North Community Church, 72 Old Main Street. The monument was built in 1889 but not dedicated until June 15, 1895. It records the names of 21 men lost in the war, perhaps most famous among them being Col. Fletcher Webster (son of Daniel Webster), commander of the 12th Massachusetts Infantry. The primary inscription reads, “The Town of Marshfield Honors the Patriotism and Devotion of her Sons who Fell in the War of 1861-5 and Gratefully Inscribes their Names on this Stone.” It was built at a cost of $1,500. The pedestal and statue are both constructed of Quincy granite. The speaker on the day of the dedication was the Secretary of the Commonwealth, William Olin, formerly Lt. Col. of the 36th Massachusetts and future chief-of-staff of the national GAR. For additional photos including names see “Marshfield” at the Massachusetts Civil War Monuments Project. Plympton: Located on the Town Green across from the Plymouth Congregational Church, 254 Main Street. 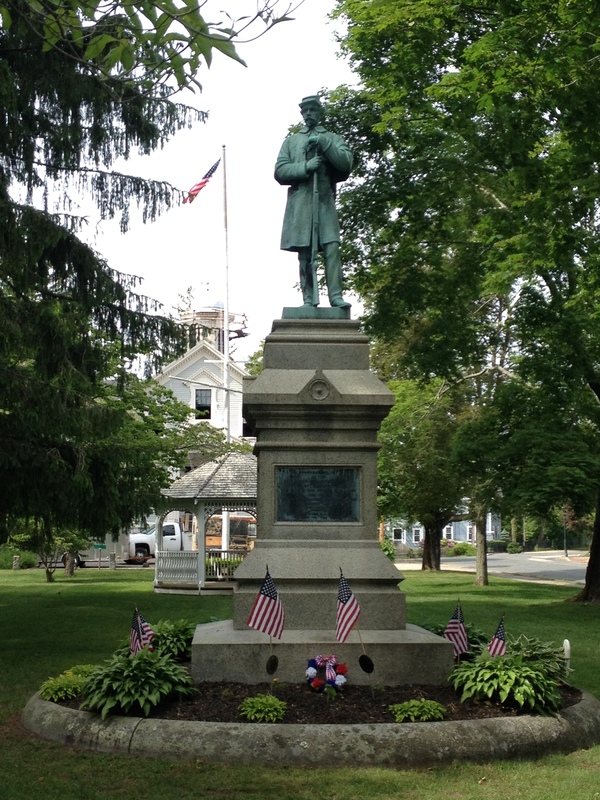 The monument was dedicated on November 20, 1889 and records the names of 15 men from Plympton lost in the war. The primary inscription reads, “Erected By The Ladies’ Memorial Association Of Plympton To Commemorate The Deeds Of Her Loyal Sons Who Imperiled Their Lives For The Preservation Of The Union 1861-1865.” It was constructed at a cost of $1,400. The president of the organization was Mrs. William Fuller, who called a meeting of Plympton women to organize an association in 1886. They raised funds through parties, suppers and donations. The association would also become responsible for annual Memorial Day exercises.The chairman of exercises on the day of dedication was Samuel Cole Wright, formerly a soldier from that town and recipient of the Medal of Honor (one of a small few Civil War recipients on the South Shore) for bravery exhibited at the Battle of Antietam while serving with the 29th Massachusetts Infantry. The principal speaker was Rev. Edward A. Horton of Boston. For additional photos including names, see “Plympton” at the Massachusetts Civil War Monuments Project. Pembroke: Located in front of the First Church and across from the Town Hall, 100 Center Street. The monument was dedicated on June 12, 1889. It is unusual in that it records the names of all those who served from Pembroke in the following categories: Died in Service (20 names), Died after Discharge (21 names–it seems most of these were men who died in the interval between the war and the construction of the monument, probably due to causes not associated with the war), Living, January 1, 1889 (95 names). 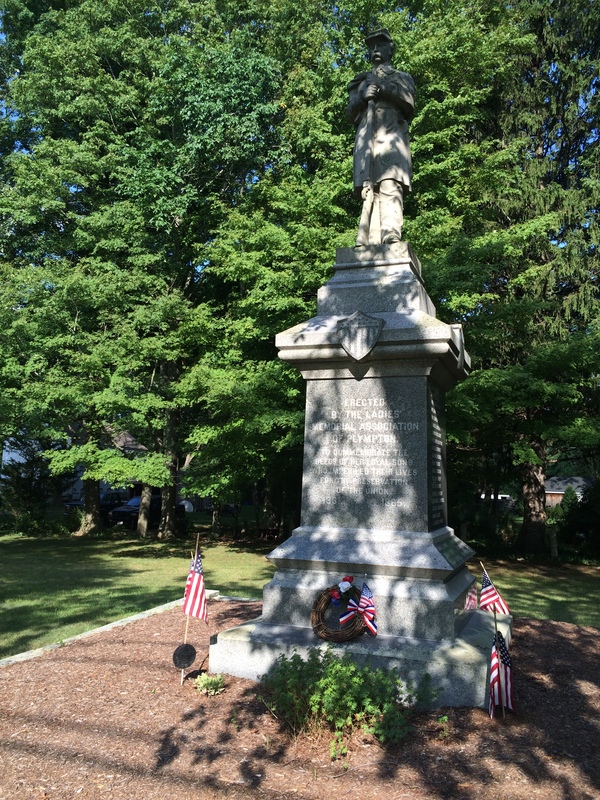 The primary inscription reads, “Erected by the Citizens of Pembroke to Commemorate the Brave Deeds of Their Loyal Sons in the War for the Preservation of the Union, 1861-1865.” The base of the pedestal is made of Hallowell granite and the pedestal and statue of zinc or “white bronze” which is cast hollow and therefore significantly less expensive. It is one of only two zinc monuments in this survey. It was constructed at a cost of $1,056. The Ladies Sanitary Aid Society of Pembroke, who worked throughout the war to aid soldiers, contributed the balance of their treasury. The contractor was the White Bronze Company of Bridgeport, Connecticut, represented during the ceremonies by Brainard Cushing, Esq. of Rockland who extolled the enduring nature of the medium which would last, he said, long after granite monuments had crumbled away. He also mentioned that the “parade rest” stance of the soldier was symbolic–the soldier’s work is done, but he still stands ready. This symbolism may account for the overwhelming frequency of this pose in monuments. Plymouth County, like most of Massachusetts, had voted mostly Republican in the election of 1888, therefore it is possible Shepard’s political message may have seemed a bit bold to his Pembroke audience. For additional photos including names, see “Pembroke” at the Massachusetts Civil War Monuments Project. Carver: Located in Shurtleff Park, across from the Carver Town Hall, 108 Main Street. Dedicated on Memorial Day, 1910, the monument records the names of all Carver men who served. The primary inscription reads, “Carver Honors Her Soldiers and Sailors who Fought to Save our Country.” In 1905, the Carver Ladies’ Soldiers Memorial Association was organized under the leadership of Mrs. P. Jane Barrows. Through dinners, fairs, donations and an appropriation from the town, they were successful in raising the necessary funds. 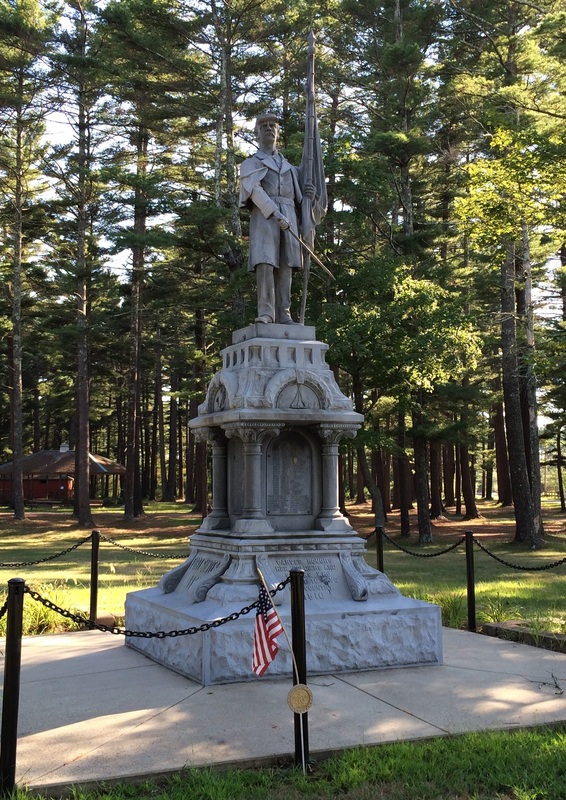 The moment is made of zinc and is unique among South Shore monuments in that it depicts an infantry color bearer, dutifully guarding his colors with crossed sword. For additional photos including names, see “Carver” at the Massachusetts Civil War Monuments Project. Scituate: Located on Lawson Green at the junction of First Parish Road and Branch Street. It was dedicated on June 17, 1918 even as some 125 men from Scituate were fighting in World War I. The primary inscription reads, “Erected by the Town of Scituate in Memory of its Soldiers and Sailors 1861-1865.” The monument was originally proposed by Scituate’s wealthiest resident, the “Copper King” Thomas W. Lawson around 1903. He went so far as to build a foundation for it but, according A.A. Seaverns, the adjutant of the local GAR post, “the over-free expression of opinion on the part of some of his fellow citizens influenced him to change his mind.” Another source states the controversy more bluntly. The question of Lawson’s proposed $50,000 gift to the town was raised at a town meeting and “it was received with so much derision and contempt that the agent refused to submit the offer of the gift.” Frustrated, Lawson offered the funds to Winchester, Massachusetts where he kept another residence. Often embroiled in various controversies, both local and national, Lawson was a headstrong figure who showed disdain for the local leaders of Scituate and therefore their rejection of his gift is not altogether surprising. 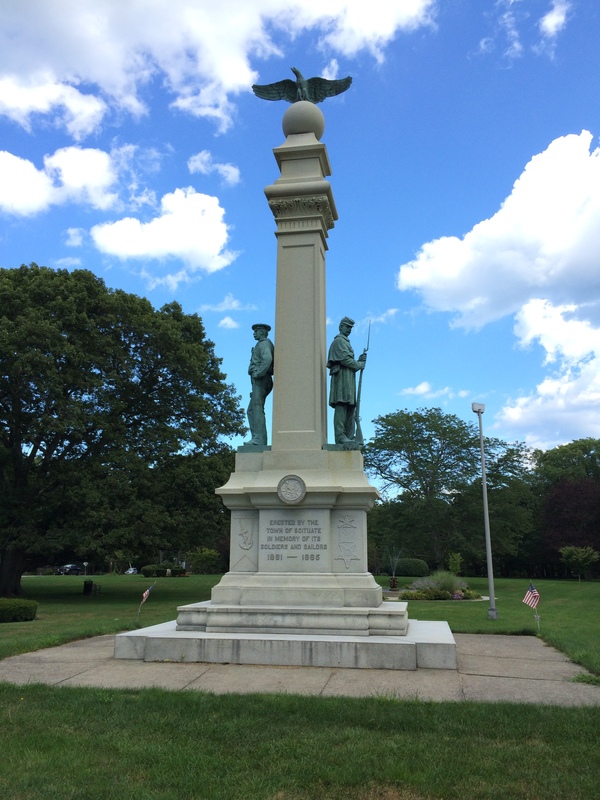 Still, Lawson managed to keep a hand in the process, and with his involvement, it is no wonder that the Scituate Soldiers and Sailors monument would see further delay, controversies and even litigation. In 1916, an injunction was filed to halt the process begun by contractor James Craig & Co. due to disagreement between certain Scituate residents and the design committee (the latter group being supported by Lawson). The matter was eventually straightened out in court and construction proceeded. The result, in this writer’s opinion, is the handsomest of the Civil War monuments on the South Shore. The granite monument features two bronze statues of a soldier and sailor. Two sides of the monument prominently display the names of two Medal of Honor recipients from Scituate, Pvt. William H. Osborne of the 29th Massachusetts and Pvt. Charles N. Gardner of the 32nd Massachusetts. For additional photos see “Scituate” at the Massachusetts Civil War Monuments Project. 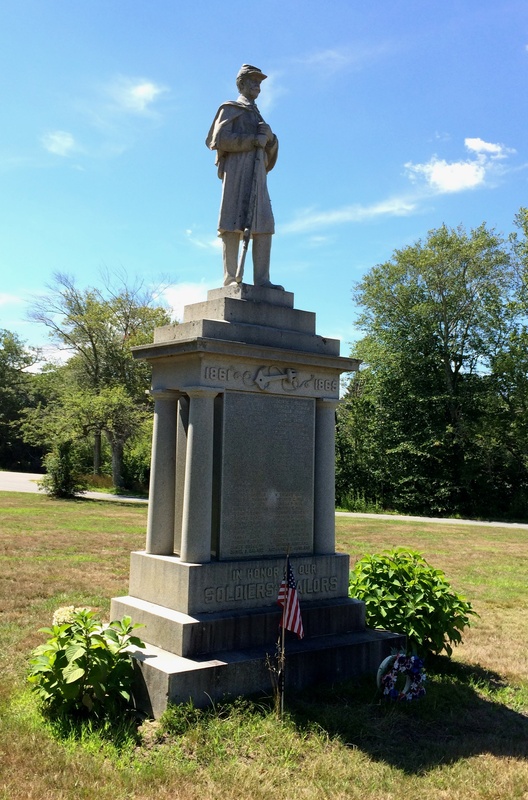 Cohasset: When Civil War veteran and historian Alfred S. Roe published his comprehensive survey of Civil War memorials and GAR posts in each town of the Commonwealth in 1910, he printed a brief report from Cyrus Bates, commander of the Cohasset GAR post. 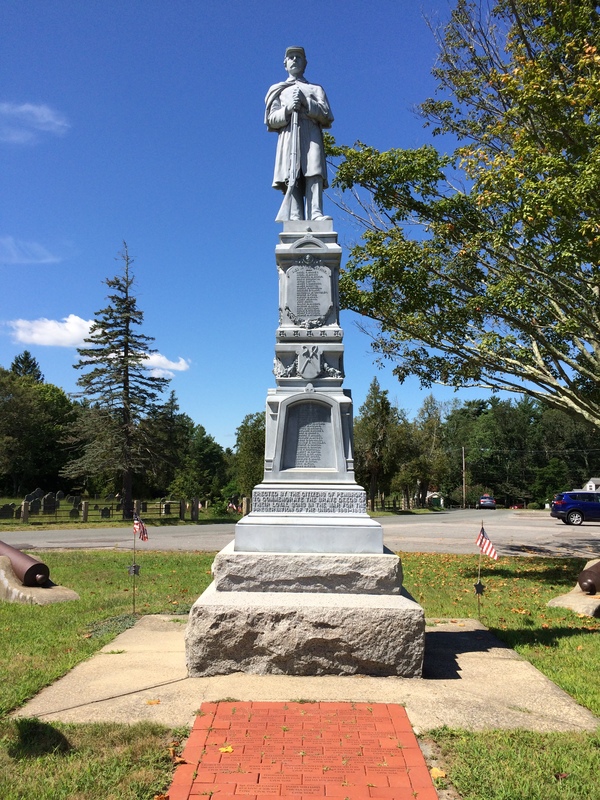 With regard to a monument, Bates wrote, “No Rebellion reminders here.” Cohasset did not construct a memorial to her sons who served in the Civil War until 2006. 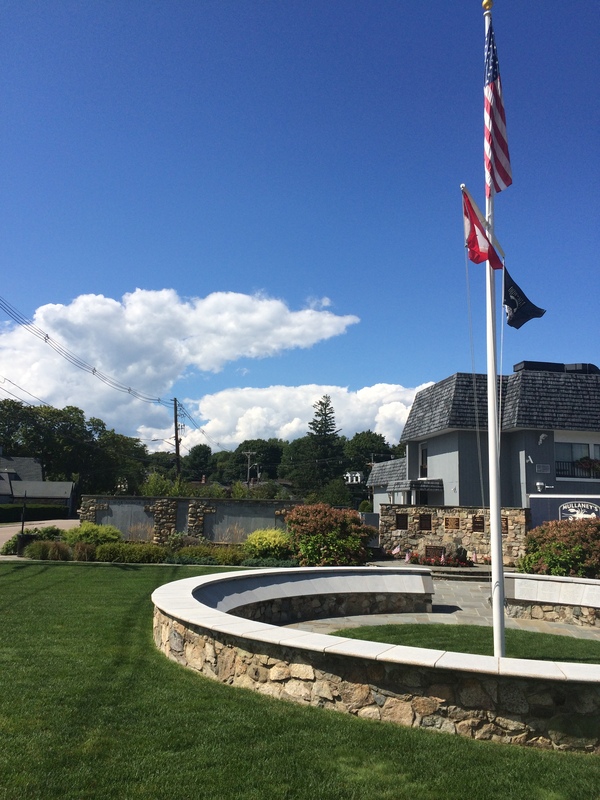 The beautiful Cohasset Veterans Memorial, dedicated on Veterans Day 2006, includes tablets listing the names of those who served from that town in conflicts from the Civil War to the present. The names of those who lost their lives are marked with a star. It is located at the junction of Summer and Border Streets on the shore of Cohasset Cove.